"Does Indiana still raise any boys who roam woods or fields and might even explore the margins of a river? If so, who guarded the poisoned area to keep out any who might wander in, in misguided search for unspoiled nature?" WILLITS, California. -- October 1 was to have been the deadline for any additional plaintiffs to join a Federal lawsuit against Remco Hydraulics, their corporate owners Whitman and Pneumo-Abex, and the $9 million Willits Environmental Remediation Trust, created by a Federal Court consent decree five years ago. About 1000 plaintiffs were expected to join the Federal court actions, according to attorney Ed Masry, whose firm, Masry & Vititoe, has filed complaints on behalf of those injured. Although the deadline has passed, questionnaires still are being accepted and may be obtained from Masry, 1-800-96-TOXIC, or from Willits Citizens for Environmental Justice. Citizens say officials have failed to provide information about the contamination to soil, air, and groundwater from chromic acid, hexavalent chromium, tetrachlorethylene, trichloroethylene, dichloroethylene, vinyl chloride, freon, diesel fuel, and other toxics used in the chrome-plating and manufacturing operation. U.S. District court caseCity of Willits v. Remco Hydraulics, Inc.(No. C96-0283 SI), originally was filed in 1996, and the court had ruled that no additional plaintiffs would be heard after October 1, 2001. Attorneys for Whitman Corporation have subpoenaed reporter's notes and lists of public meetings about the Remco site in an attempt to have some cases dismissed. The statute of limitations on toxic tort claims is one year from the date of "suspicion," Masry explained. Claims will be considered on a case-by-case basis and are not being filed as a class-action suit, he said. Masry and Erin Brockovich appeared in Willits in August, 2000 telling residents the levels of contamination in Willits are some of the highest they have seen. Masry's firm since has been investigating claims by others who believe they may have been affected by the contamination. Anyone who lived in Willits during the '60s, '70s, '80s, or '90s, especially if they used well water, and anyone who attended Blosser Lane Elementary School or Baechtel Grove Middle School may have been affected, according to Masry. He also reported that chromium was NOT detected in municipal Willits water, which is piped in from a nearby reservoir. Willits residents suffer from high rates of cancer, leukemia, miscarriages, and birth defects. They also report internal bleeding and other stomach, gastrointestinal, and reproductive ailments, diabetes, headaches, fainting, rashes, nosebleeds, pain, numbness, and metal taste or loss of taste and smell, according to Donna Avila, lead plaintiff for local residents. The town, located at the edge of an ancient lake, floods regularly. Next door to Remco, frequent flooding has washed "Mountain Dew-colored" toxins into residences located only a few feet from the closed factory. A candy store lures children across a contaminated drainage ditch from the neighboring schools, and a Boys and Girls Club is planned nearby. U.S. District Judge Susan Illston traveled to Willits for a public hearing on October 30, 2000. One former worker told the judge, "All of these creeks were orange. We dumped in all these creeks around here." Parents of schoolchildren told of nosebleeds and illnesses suffered after only a few months attending the schools. Neighbors living near the plant so far have not been included in a $2 million medical monitoring reserve that was to have been created by the consent decree. The Willits Trust already has spent more than half of the $9 million. All citizen attempts at intervention in the consent decree have been dismissed, although the agreement establishing the Trust has been modified twice, and the original trustees and special master have been replaced. Citizen requests for injunctions also were dismissed. Despite having been filed as "the People of the State of California and the City of Willits vs. Remco," the citizen attempts to intervene forced the California Attorney General to rule that the City had no authority to represent the State of California, and that neither the City nor the State actually represented the people, but only the government entities. In a related case, the Ninth U.S. Circuit Court of Appeals has ruled that State Court remedies have not been exhausted and has remanded to State court a case involving the wrongful death of five-year-old Forrest Hernandez. Hernandez v. Remco, Case No. C98-3987SI and Appeal No. 00-15834, was heard by a three-judge panel in San Francisco on April 10, 2001. The decision, dismissing the federal case on a technicality over a 60-day pre-filing notice, was listed as "Not for Publication," which means that it cannot be cited as precedent. The Appeals Court also ruled that civil rights claims should be heard first in State Court but may then be appealed to Federal Court. Hernandez v. Remcoseeks damages against Remco and against Mendocino County officials for covering up and destroying evidence in the unusual death of five-year-old Hernandez, who died of internal bleeding August 22, 1997, after ingesting a small amount of water from Baechtel Creek in the hills outside Willits, three miles upstream from the Remco site. Forrest had been visiting the area along with his baby brother and his parents. "The small creek in Muir Mill Canyon had contained fish, frogs, and salamanders when we arrived, so we let him play in the creek. But then we left town for a few days at the beginning of August 1997," his mother explains. "While we were gone there was a fish kill downstream in town, but no warning signs were posted." Forrests parents became worried and called doctors that afternoon when his skin turned green. Neither Stanford nor the local hospital recognized the danger, and Forrest returned with his family to the tent where they were staying. He was restless and thirsty all night. About 2:30 a.m., he spoke his last words, "I just want to feel good. I just want to be happy," and collapsed unconscious. He was rushed to Howard Memorial Hospital, one block away from the Remco plant in Willits, but efforts to resuscitate him failed, and his body stiffened rapidly. It looks like he was poisoned, a deputy sheriff said. That same day, August 22, 1997, a final consent decree was being signed in the court case in San Francisco. The Citys suit resulted in findings of imminent and substantial endangerment to soil, air, and groundwater. An autopsy was performed at Anker-Lucier Mortuary, owned by then Willits mayor Tom Lucier. It reported that Forrest bled from the omentum, a layer of blood vessels between the stomach and the intestinal tract. No other sign of any injury or cause of bleeding was indicated. Forrest had mild hemophilia (a congenital blood-clotting disorder) but had never experienced spontaneous bleeding. Mendocino Sheriff-Coroner Kevin Broin and medical examiner Dr. Jason Trent listed official cause of death as: 1)hypovolemic shock due to 2)multi-focal acute hemorrhage due to 3) Factor VIII deficiency (hemophilia). Despite the fish kill two weeks earlier, downstream in the same creek, officials in both instances failed to test for chromium or other toxic chemicals. Official forensic toxicology tests on Forrest were conducted only for illegal drugs and were negative. State Health investigator Dr. Debra Gilliss also refused the parents' request and failed to test for chromium. Any remaining samples, possibly including Forrest's organs, were "purged" before the one-year statute. When we asked about chemicals in the area, no one knew anything, John Hernandez said. 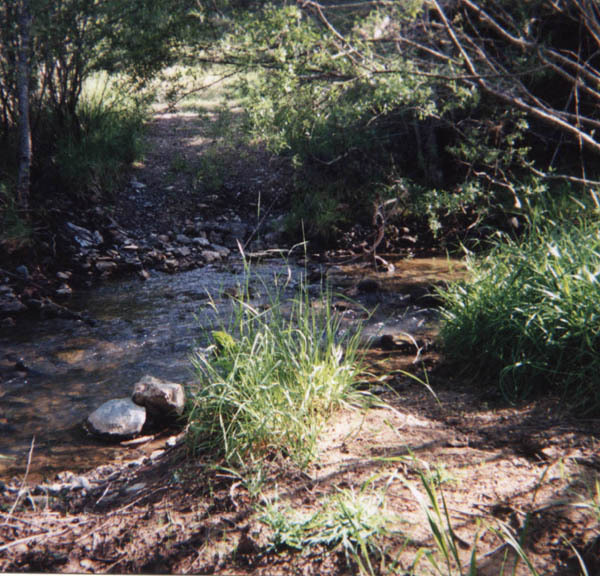 The spot in Muir Mill Canyon where Forrest sipped from the creek. Forrest's family learned of the Remco court case in newspaper articles and eventually ordered their own tests, which showed 49 micrograms/liter (ppb) total chromium in samples of vomit and 13-17 micrograms/liter in creek water. Total chromium includes both chromium III (trivalent), a naturally occurring element which is not known to be toxic; and chromium VI (hexavalent), an industrial heavy metal waste product that is a potent neurotoxin and carcinogen. Ingestion of hexavalent chromium can cause vomiting, gastrointestinal irritation, and can be lethal at certain concentrations, according to the Agency for Toxic Substance Disease Registry (ATSDR) in Atlanta (www.atsdr.cdc.gov). Airborne, it is similar to asbestos and is known to cause cancer and other respiratory ailments. One study placed chromium among the top five hazardous chemicals nationwide (along with lead, benzene, arsenic, and trichloroethylene). A 2000 Update on Chromium issued by ATSDR describes several recorded cases of accidental poisonings from ingesting chromium 6, including a 14-year-old boy who ingested the substance from a chemistry set and died several hours later. The update also reports that "dermal exposure can cause death in persons with pre-existing conditions," citing cases from 1922 of deaths as long as four weeks after skin contact with chromium 6 compounds potassium dichromate, chromium trioxide (chromic acid) and sodium chromate. From court documents, Forrestss parents learned that five underground plating tanks from 32 to 70 feet deep intersect groundwater aquifers. Since the 1940s the site had been used in chrome-plating operations for a variety of applications, beginning with sawmill equipment and expanding to include hydraulic cylinders, military gun barrels, offshore drilling equipment, tunneling equipment, hydraulic actuators for nuclear power plants, and steering mechanisms for nuclear submarines. Founder Bill Harrah imported the old Reno, Nevada arch, installing it as the Willits arch. He also was a major supporter of Howard Memorial Hospital. The hospital and health department now are overseen by the Mendocino County Supervisors, one of whom is mortuary owner and former Willits mayor Tom Lucier. The company had operated as Harrah Brothers, Pneumo-Abex, Stanray, and Remco Hydraulics, and had been reported numerous times for spillages and discharges into nearby Baechtel Creek (EPA ID#CAD000097287). "I knew it was dead wrong." At one hearing a Whitman attorney told the judge, "Your honor, there are documents we don't want exposed to public view." Evidence now indicates that dumping at Remco was intentionally performed upon orders from management over a period of years. Former workers testify in depositions to witnessing and performing dumping into groundwater, into Baechtel Creek, and directly into a well. I knew it was dead wrong, said one, I was just a worker and I was following orders. Another says he came into the plant on a weekend and saw the boss and others emptying several barrels into a neighboring well. The depositions are under a gag order in Los Angeles court case Jensen-Kelly et al. v. Allianz Insurance et al. A FOI request to the City of Willits in May 1998 showed no records for the storage, transportation, or disposal of hazardous waste in the previous year. Officials at EPA and the State Regional Water Quality Control Board report they have not issued, and cannot issue, a permit to dump into the sewer. In December 1998, another Willits site, the Peters property at Shell Lane, was investigated by the California Department of Toxic Substance Control and Federal ATF officials. Criminal investigations are continuing, according to the California Attorney General and the U.S.Attorney in San Francisco, but no criminal charges have yet been filed. Current Trustee and Site Project Manager Anne Farr last year proceeded with plans to inject calcium polysulfide (lime sulfur) and molasses into the ground in an attempt to convert toxic chromium VI to chromium III. Those studies continue. The U.S. EPA, responding to health concerns from the community, has asked the California Department of Health Services Environmental Health Investigations Branch (CDHS-EHIB) to evaluate the potential health impact that may have been caused by contamination from the Abex-Remco site in Willits, Calif. Gina Margillo is conducting the study, (510)622-4476, e-mail: GMargill@dhs.ca.gov. In February 2001, Rick Lensing, 31, died of a throat tumor. He had lived in Willits, at Luna Market and Apartments, for eight years. When asked to test for chromium again, DHS officials still claim they cannot find a lab to test a body for chromium and admit they do not know how they would respond to a death from chromium. EPA and State standards for total chromium in drinking water are 100 ppb and 50 ppb respectively. But EPA under former President Clinton had admitted those standards were established based on exposures for adult males--not for children, women, the elderly, or those with illnesses or disabilities. Those standards also were based on an assumption that only a small percentage of total chromium would be chromium 6. That assumption has not proven true, and chromium 6 has constituted as much as 100 percent of total chromium in some tests. 4800 communities throughout California were ordered to begin testing for chromium 6 this year. Tests announced have revealed chromium 6 levels at 54 ppb in Los Angeles, 38 ppb in La Selva Beach, 22 ppb in Riverside and San Bernardino, 18 ppb in Santa Barbara, 23 ppb in Yolo County, 10 ppb in Solano, and 4.1 ppb in Santa Clara, according to California Water Association reports. Hinkley, the southern California desert community featured in Erin Brockovich, had tested as high as 24 ppm, while shallow groundwater readings in Willits have been as high as 360 ppm. Whether ingestion of lower amounts poses a significant health risk has not been proven, according to DHS officials, who claim more studies are needed to establish new standards. One proposal would lower the acceptable amount for chromium 6 to 2.5 ppb. Others support even lower limits. An article in Clinical Reviews in Toxicology, Volume 27, Issue 5, 1997, "Toxicity and Carcinogenicity of Cr (VI) in Animal Models and Humans," by Max Costa of the Nelson Institute of Environmental Medicine and The Kaplan Cancer Center (New York), reports animal studies and experiments on human volunteers suggesting that hexavalent chromium causes increased risk of bone, prostate, lymphomas, Hodgkins, leukemia, stomach, genital, renal and bladder cancer and concludes, "Exposure of humans to any amount of chromium VI by inhalation, ingestion, or on the skin should always be avoided." According to ATSDR's 2000 update, "whereas chromium VI can readily be transported into cells, chromium III is much less able to cross cell membranes. The reduction of chromium VI to chromium III inside of cells may be an important mechanism for the toxicity of chromium compounds, as free radicals are emitted in the process of breaking down," also resulting in chromosome aberrations. Doctors nevertheless have concluded that "additional data would be useful," so FEDRIP studies at four universities will continue to study the effects of chromium 6 on children, other humans and the environment. 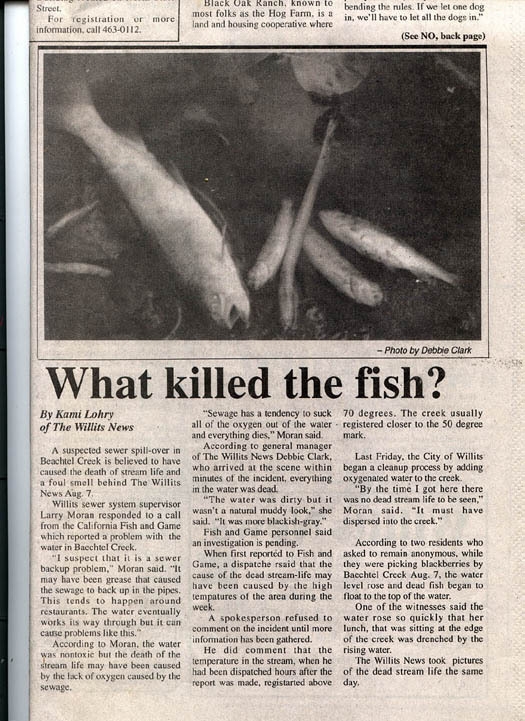 Link to Santa Cruz Sentinel article, "Forrest's Legacy, October 15, 2000." Link to S.F. Chronicle article, "A Town Diseased and Torn." Link to S.F. Chronicle article, "Chromium Taking Center Stage." Link to Santa Rosa Press Democrat article, "Tainted legacy: Questions still swirl over extent of contamination from Remco plant." Link to Santa Rosa Press Democrat article, "Battle over responsibility caps long history of toxic trouble." like the voice of a ghost.